National Geographic tornado research operations day 11. Upslope play in western Montana. Targeted Great Falls area for afternoon supercells. Van's transmission died during lunch, ending our chase and chase vehicle. "Day 1 Synopsis: The glacially slow approaching shortwave will move slightly eastward today and promote surface low development in north central Montana. In response, moisture advection will likely contribute to dewpoints in the low 50s over the upslope flow regime, which combined with the upper forcing will form the primary mechanisms for storm initiation. As we are playing high elevation upslope terrain - initiation will likely be earlier in the day, though the capping may hold things off until ~20-21Z based on the latest CAMs (note that yesterday we had initiation 18-19Z, maturation by 20Z, CAMs suggested 18-19Z). Moderate capping over the warm sector will result in relatively isolated to scattered storm coverage. Dewpoints via surface analysis are currently in the mid-low 50s over the eastern half of the state, with a gradient toward mid 60s in central North Dakota and stretching southward. Vertical wind shear is progged to be between 50 and 60 knots effective, with easterly/ESE upslope trajectories north of the boundary stretching SE toward Billings from NW of Great Falls. Storm motion for the right mover will once again be effectively ENE to NE depending on the degree of storm rotation that develops. Helicity is expected to be somewhat more extreme than yesterday, particularly toward 03Z, with strong turning from ESE to SW strengthening with height, though until the LLJ arrives 0-3km helicity appears to max in the mid 250 range, and 0-1 in the 100 range. SPC slight risk for 15% hatched hail is consistent with relatively steep lapse rates and moderate instability (1000-1500 J/kg, but more than enough for Montana). Compared to the prior evenings outlook, we have seen a greater breadth to the 2% tornado risk area in SPCs depiction, which reflects inconsistency in the CAM solutions for todays activity. Both NAM and HRRR depict supercellular storms with significant updraft helicity swaths, developing on or east of the Great Falls/Havre corridor, with the more easterly extreme in NAM and westerly in HRRR (which was bang on yesterday). However, the latest HRRR runs have trended towards weaker storm returns over central Montana, possibly reflecting weaker moisture availability or stronger influence from the capping inversion. At the time of the 11Z HRRR run, no strong returns had really emerged by 23Z, suggesting that close attention needs to be paid to the mesoscale obs over the course of the day. Intriguingly, the 11Z HRRR develops two cells by 00Z and is consistent with the 10Z run in that we see a cell track the Great Falls-Havre route, and a second traversing the interstate east of Billings, indicating initiation potential off the Yellowstone high terrain. This appears to be closer to the depicted moisture axis in both the NAM and GFS solutions, though both have more substantial capping in this region, suggesting a more conditional prospect for initiation. As an initial target, I would look toward Lewiston, MT around 18Z, with a view to keeping an eye on development in the Great Falls/Glacier NP Mountain chain corridor, and over the Lewis and Clark National Forest and Little Snowies as the source of upslope initiation as for yesterday. Data is sporadic along the road east of Lewiston, with no coverage pretty much between there and Glendive for ATT, and according to the coverage map, potentially similarly for Verizon or more sporadic coverage. This suggests a premium on a holding location with data access, which as for yesterday can be followed by visual chasing once storms are up. Day 2: A continued likelihood is for Day 2 to set up over the eastern MT/western ND region, with the eastward moving and deepening surface low (994) positioned over central-eastern MT, a stationary boundary and the slowly transitioning upper trough. In response, richer boundary layer moisture into the 60s will be advected into northeastern MT, which along with steep mid-level lapse rates will lead to large degrees of convective instability and CAPE. The strengthening low and shortwave will promote moderate-strong vertical wind shear, with large low-level hodographs, particularly over NE Montana (e.g. a random sounding of http://climate.cod.edu/hanis/model/fsound/index.php?type=06|GFS|NGP|con|scp|42|47.52,-104.36|ml|severe). This suggests a conditional risk for a significant tornado, particularly near the effective triple point and certainly a few tornadoes over the region. 4km NAM has intently developed several large supercells over the region arranged N-S, with upscale growth later in the period. Reflecting the higher potential for significant severe weather, SPC has now elevated the eastern MT region to Enhanced Risk. At a guess, based on current model projections - we will definitely want to be in the Sidney-Glendive-Circle MT region around 00Z. Day 3: Will likely be a positioning day with an offhand chance of a nice supercell in readiness for the next central plains system. Two areas of potential are currently flagged, MN, where it is possible favorable low level hodographs will be quite favorable, but accompanied by weaker upper shear due to the departing shortwave, or western NE, where upslope flow trajectories may yield supercell and tornado potential in an environment characterized by upper 60s moisture, and possibly a stronger degree of shear associated with a shortwave. However, the main reason to head down to NE is preparation for Day 4. Day 5: A unseasonably strong low center moving toward central NE will produce extreme instability and moderate to strong vertical wind shear will yield a favorable tornado environment through NE and IA and potentially into KS depending on forcing. http://climate.cod.edu/hanis/model/fsound/index.php?type=06|GFS|CGP|con|scp|114|40.61,-96.46|ml|severe "
Twelve days on the road now and no tornado yet. 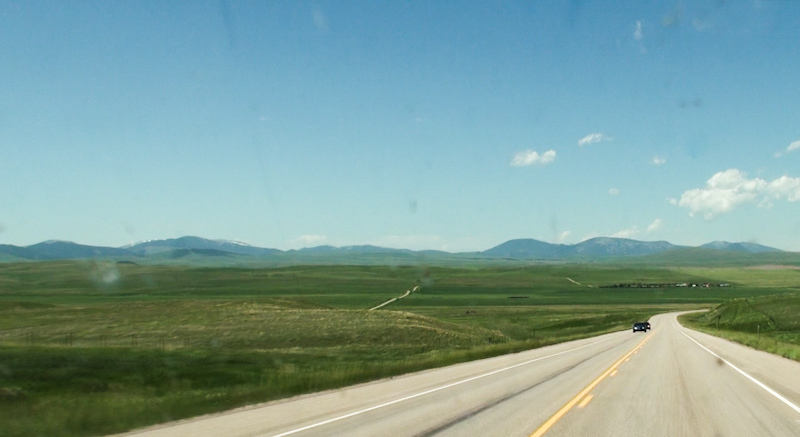 We were super geeked to be chasing across the heart of Montana though. "Big Sky". The day looked like a great shot at photogenic supercells in gorgeous terrain and maybe a chance for that rare Montana tornado too. The other two teams had stayed elsewhere the night before and the plan was to meet up with them somewhere out in the field during the afternoon. Brindley and I, going cross country on our own, had a postcard drive across the Montana countryside as we left Miles City in the morning for a preliminary setup point of Great Falls. There were even some snow capped mountains in the distance. Complete and utter disaster struck after we stopped at the Pita Pit in Great Falls for lunch. The van started up with awful grinding noises and lurchingly spasmed forward when I put it into gear. 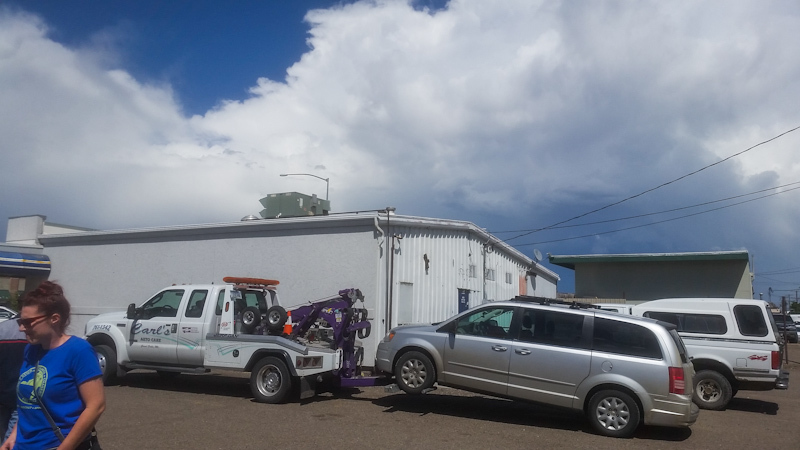 I limped it across the street to a mechanic shop that was conveniently close, but then couldn't shift the van at all, and had to get it towed out of the back road where it was stuck. Every shop in town that worked with transmissions was booked for weeks, and the prognosis wasn't good. A new transmission would likely have to be shipped in. The process would take weeks and cost thousands. In beat to hell condition with 183,000 miles and thousands of miles from home, I decided it wasn't going to be worth it. The van was dead. Five year of amazing memories chasing in a van that had nicknames like, "Bubbles" and "Nebraska Jones" and like that it was over. Brindley and I were heartbroken. Adding insult to injury, we could see the tower of a beautiful supercell going up to the east. It went tornado warned as our van sat helplessly on the back of a tow. With some luck, Brindley and I made it to Enterprise just before they closed and scored a deal on an F-150, which is all they had left. We were reluctant about getting a truck, but it turned out to be a four door. There was plenty of room for all of our gear that needed to be sheltered inside, and ample room in the bed for all of the hardware and camera dome components that could stay outside. We stripped the van down in a side lot next to a mechanic's shop, and then left it there. The final resting place of the van before it was junked. We got a room in town to recover from the disaster, but we were actually in decent shape to meet back up with our other two teams and participate in the next day's chase. 2016 will go down as one of my toughest chase seasons with incredible heartbreak and thousands of long miles. An immediate slap in the face, the season kicked off with a tornado so close to my house you could literally *hear* it from my back porch. I wasn’t there, and instead busted on other storms trying to make a daytime play. Then it was an entire week in April living in the van, chasing “huge” setups in the plains, but I came home with nothing to show for it, and missed more tornadoes close to home. Redemption at Wray was both overwhelmingly spectacular and bittersweet. The overarching stovepipe literally chased us up highway 385, forcing us to miss about half our shots and also the best light. Two days later we gambled on the long odds secondary target and not only busted, but missed one of the biggest events of the year. 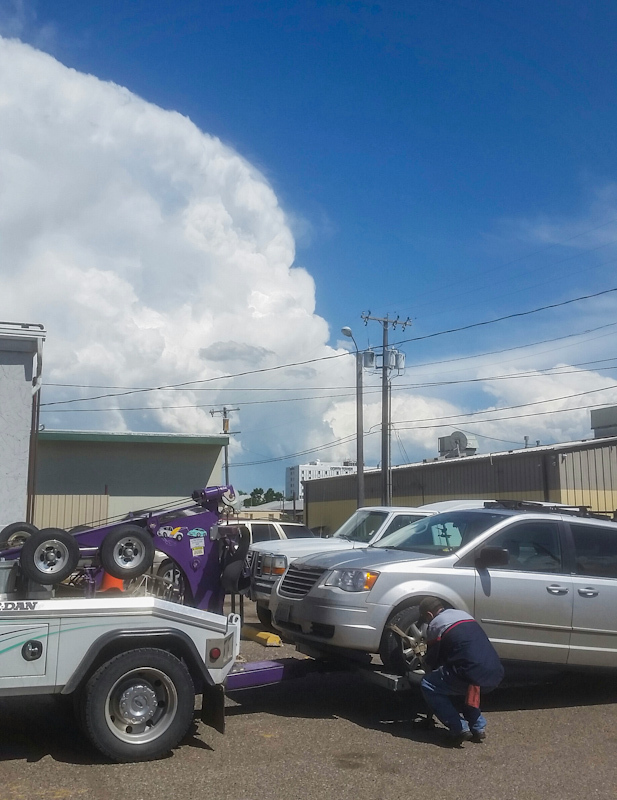 Adding insult to injury, the van had to get towed out of the mud with active Tornado Emergencies a state south of us. After Wray I decided that I was not going to miss any more shots due to my camera setup. My homemade camera dome is no longer cutting it, and destroys any gains from using a 4K video camera or DSLR. Getting a quality shot now requires that we stop and open up the enclosure, which defeats the entire point of the dome. Watching “ruined” footage from Wray that was shot through the dome is heartbreaking. It was time to replace the dome. I’ve been designing and building its replacement for almost two years now, a rotating turret meant to address all of the dome’s shortcomings. However going into 2016, I was still scrambling to get it done: fastening hundreds of bolts, motors and wiring, and inventing solutions to problems as they arose. Brindley and I were scheduled to participate in a huge project: a National Geographic expedition, one of three teams documenting tornadoes with the goal of expanding research from the El Reno Survey to new events. We had to pick a block of twenty days for the project, and fatefully the group picked June. I was determined to get the turret done in time, even if it meant missing chases for I was now at the point where it pained me more to see the dome ruin tornado shots than to sit out chases working on the turret. And sit out chases I did. Southwest flow aloft overspread the Great Plains going into the fourth week of May. It looked like an active set of days, but nothing huge, maybe a few 5% slight risk tornado type setups. I was prepared to miss a couple tornadoes. We’d get more in June with probably better setups, and I wanted to be ready for it. What would follow was practically the worst case scenario. The days we sat out wound up being the chase days of the year, including multiple large, violent tornadoes and concurrent tornadoes. I wasn’t watching though. I was “off the grid” working on the turret and didn’t want to be distracted by what I was missing. By May 29 the turret was (sort of) ready for the field after initial stability tests and we were rolling for New Mexico to start what would be 24 straight days on the plains. The turret was a total failure. After our first chase with it, multiple mechanical problems surfaced that would require a complete redesign. I missed the late May outbreak sequence for nothing. There would be no redemption either. June wound up being one of the hottest and quietest for chasing on record. We crisscrossed the Plains for three weeks chasing mere hopes and dreams of tornadoes, perpetual mirages on the 2-3 day outlook that would never materialize. 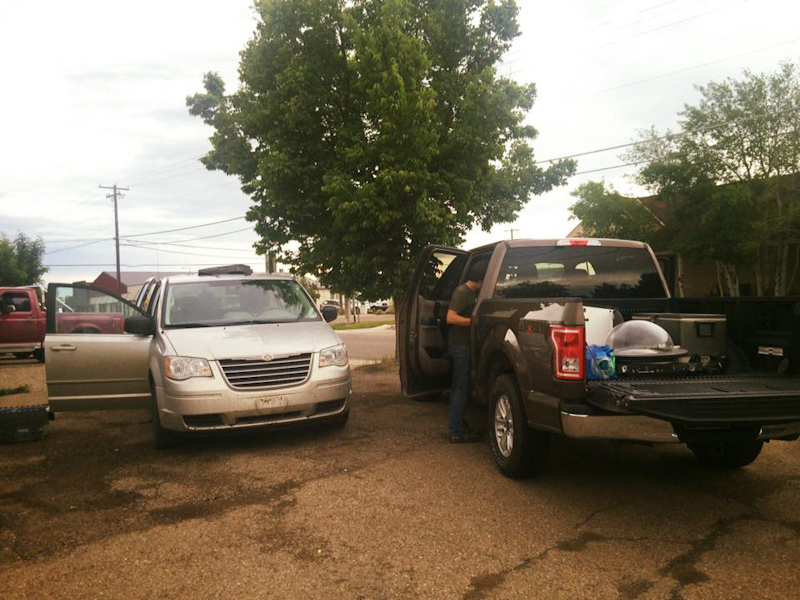 Over ten thousand miles, and we documented zero tornadoes. As if sacrificing practically the entire season for a failed dream wasn’t bad enough, it would get worse. In Great Falls, Montana, at the foothills of the Rocky Mountains, we were about as far as we would ever go for a chase. It was there that the van died. Just five years old, we had driven her hard and she went belly up at 183,000 miles. We stopped for lunch in town that day and when we came back the transmission was toast. We left her there. So many great memories, stories, and adventures in that van, it was like losing a friend. It was a heart wrenching end to a tough season. That one photogenic tornado though… That’s what makes it all worth it. Wray was one of the most spectacular and intense experiences of my life. It’s the love of chasing and the plains that keeps me going too. If I needed epic tornadoes I would have burnt out a long time ago. This balmy October weather has me itching to get back out there. A gusty yet humid south wind has my “Supercell Deprivation Syndrome” raging. Next year we’ll be back out there, giving our project another shot. I’m looking forward to a new season, with a new vehicle, and new dreams. This was a devastating loss for me. I loved that van and had put a lot of work into making it a nice chase vehicle. We would have to carry out the rest of the season's research operations in a rental now. The other two teams scored gorgeous supercell shots, but the tornado eluded everyone despite a myriad of warnings. I would have been even more devastated if this cost us the tornado shot of the project. So at least there was that. Get your transmission checked and serviced if you notice quirks in shifting and are about to go on a ten thousand mile road trip.